Solar Versus Nuclear: Choosing Energy Futures study is an eight-chapter text that studies the long-term implications of Sweden's decisions to explore nuclear energy and other alternative development options. Sweden's high standards of living, energy intensive industries, advanced technology in many fields, strong tradition of electrification and a competent utility organization, abundant reserves of (admittedly low grade) uranium, low population density and a large number of suitable reactor sites, make nuclear energy seemed ideal. Chapter I deals with some different ways of describing and viewing energy, while Chapter 2 analyzes the earlier changes of energy sources in an attempt to describe the relations between the development of society and energy consumption. Chapter 3 is concerned with the durability and other essential characteristics of these energy sources. Chapter 4 discusses two distinct developments, one leads to a Nuclear Sweden with its energy supply based chiefly on uranium and the other to a Solar Sweden based on renewable energy sources. This chapter compares the characteristics and costs of the two alternatives and discusses the possibilities of combining them. 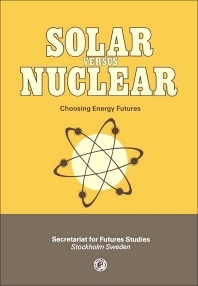 Chapter 5 covers the possible developmental tendencies built into the present energy policy, and Chapter 6 looks into the proposals for a conceivable transitional solution for the 1980's, which could reduce the dependence on oil while preserving both the solar and nuclear option as possible alternatives. Chapter 7 discusses the organizational changes in energy conservation and energy production. Lastly, Chapter 8 considers some questions regarding the effect of the energy systems on the long-term development of society. 1.5. What Is The Real Problem? What Would Nuclear Sweden Cost? 5 Where Are We Going?